It's the little series that could: Indestructibles are innovative books built for the way babies read. Printed on a unique, nontoxic, paperlike material that holds up to anything babies throw at them,Indestructibles are rip proof, chew proof, drool proof and gum proof. They’re 100% baby safe—and they’re washable. When a book gets dirty, just throw it in the dishwasher or washing machine, and voilà, the book is back and ready for more. 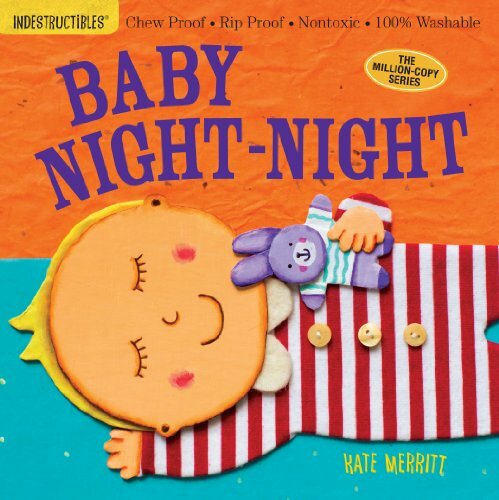 Featuring the second set of titles by Kate Merritt, whose distinctive and colorful collage illustrations are as adorable to parents as they are to babies, here is a new Indestructibles that is a joy to read aloud.Baby Night-Night makes the bedtime ritual—putting on pajamas, reading a story, and the good-night kiss—a special time for parents and children. Simple, engaging text encourages language development, and each spread is filled with sweet details.